A peek over the fence at some of the community gardens taking root along the Niagara Escarpment. Lush green leaves marked the spinach patch beside Chris Hadfield Public School in Milton last year. At least, the patch was lush during first recess. Word spread quickly once children working in the 18-bed community garden had a taste. That’s just one of the benefits of a community garden: Notoriously picky children will eat anything they had a part in growing. Even better, it’s local, healthy food. A community garden is one that grows or offers space to grow food to meet the needs of a neighbourhood’s residents. Besides tasty spinach, the benefits include reducing climate change; supporting the local economy; and contributing to food banks. Tending the gardens is also a family-friendly physical activity that promotes community spirit and a connection with nature. Those with green thumbs pass along their knowledge, and rookies gain a sense of accomplishment. Over a two-year pilot, 168 eager gardeners vied for 29 plots at the Central Park community garden in Burlington. Its success will mean two new gardens in 2014. The city of Burlington funded the garden in 2011. Burlington Green, a non-profit environmental association, received a provincial grant to operate the garden for the city. Local businesses sponsored garden beds in the adjoining communal “victory garden,” planted with vegetables that are donated to local food banks. “We chose Central Park for the pilot because it’s already busy with soccer, baseball, a seniors’ centre, arena and washrooms, and we get daily visitors,” explains Michelle Bennett, co-ordinator of the program. Central Park is an allotment garden, where the city rents plots to residents. Bennett likens the setup to a complex of backyards, with gardeners chatting and sharing advice about staking tomatoes or dealing with potato beetles. 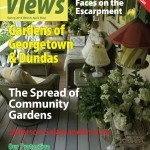 For the Canadian Mental Health Association (CMHA) of Owen Sound, “community” sums up the appeal of its garden project. 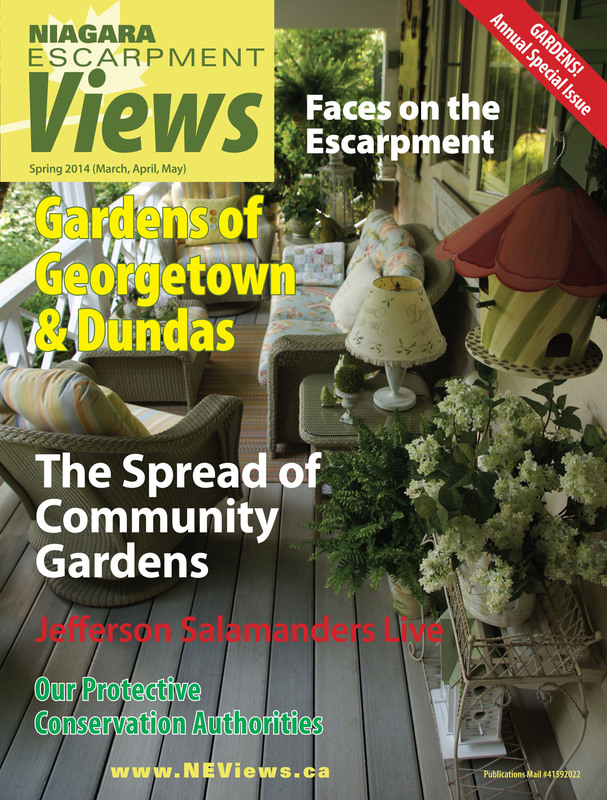 “When people walk by our gardens, they stop and chat,” says Teresa Pearson of the CMHA’s Grey-Bruce branch. She co-ordinates CMHA’s social recreation program, which offers social interaction to help those diagnosed with mental health disorders gain independence and purpose. The project began in 2009 in a small vegetable patch, with its produce supporting a brunch program at the CMHA’s drop-in facility. Since then, CMHA has added four more gardens and 63 community garden plots. “Snack gardens” also let passersby pick cherry tomatoes and other goodies from planters. Employees and clients do the planting, weeding and harvesting. Master gardeners offer advice on rotating crops or dealing with bugs. Greening Niagara believes consuming local food is the most effective action we can take on climate change. Besides requiring less fuel to ship, local produce is less likely to be genetically modified or contaminated with pesticides. The group received funding from the Ontario Trillium Foundation to provide community gardens and related workshops.In three years, it has started 15 gardens in multiple communities throughout Niagara, including St. Catharines, Thorold and Welland. Greening Niagara works with community volunteers to set up the garden, and shares techniques for soil structure, gardening, composting, canning and more. The Centennial garden in St. Catharines hosts seasonal work parties to maintain the plots, followed by a potluck lunches. Back at Chris Hadfield school, the two-year-old garden has become a living, breathing classroom. The garden also builds connections within the fast-growing, diverse community. A mix of students and teachers do the planting, watering and weeding, with families helping out over the summer. The school also plants items like karela, a type of bitter gourd, that are familiar to diverse cultures. Meanwhile, the seeds planted at Christopher Hadfield have sprouted in another way: Walsh has moved to a new school, where she’s overseeing the start-up of a second community garden. What do community gardens grow? Burlington encourages high-yielding beans, spinach, lettuce, zucchini, radishes and kohlrabi. CMHA likes produce that can be frozen, processed or thrown into soups, stews or salsa. Greening Niagara’s favourite item is squash, because it’s nutritional, filling and stores well. It also helps break up the soil for future plantings. Chris Hadfield School appeals to students with fast-growing sunflowers, abundant zucchini and unusual purple carrots. They experiment with tomatoes later turned into ketchup, vegetables made into soup and kale eaten as kale chips.